The game design programs at UC Santa Cruz were named among the top programs in the country by the Princeton Review, an education services company. The undergraduate and graduate programs at UCSC both made the company's new "top 25" lists for 2014 of the best undergraduate and graduate schools for students to study game design. "We have consistently done well in these Princeton Review rankings, and it's good to see that they continue to recognize the quality of our game design programs. In fact, our graduate program's ranking has been moving steadily upward in recent years," said Jim Whitehead, professor and chair of computer science in the Baskin School of Engineering at UCSC. 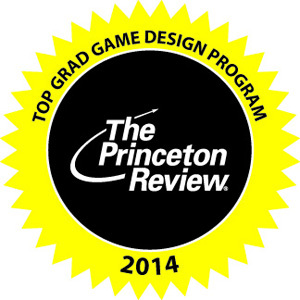 UCSC ranked 7th on the Princeton Review's list of the "Top 25 Graduate Schools to Study Game Design for 2014" and 21st on the list of the top 25 undergraduate schools. UC Santa Cruz is the only UC campus on either list and one of only three west coast schools on the graduate schools list. Brenda Romero, program director for the professional M.S. in games and playable media, attributed the strength of UCSC's graduate programs to "a combination of our focus on independent game development, the influence of our world-class advisory board, and the collective experience of our faculty in both industry and academia." UCSC offers a broad range of programs in computer game design. The Baskin School of Engineering established the first undergraduate major in computer game design in the UC system in 2006. The campus also has three graduate programs with an emphasis on games: the professional M.S. in games and playable media; the digital arts and new media M.F.A. ; and the Ph.D. or M.S. in computer science with a games focus. The Princeton Review selected the schools based on a survey it conducted in 2013-14 of 150 institutions in the United States, Canada, and some countries abroad offering video game design coursework or degrees. The survey covered a range of topics from academic offerings and faculty credentials to graduates' employment and professional achievements, and factors considered in the assessments included the program curriculum, facilities, career services, and technology. For more information on the game design programs at UC Santa Cruz, visit games.soe.ucsc.edu.